Have you ever used Microsoft Word to build and save Boolean search strings to be able to copy and paste entire searches into LinkedIn, Monster, Dice, or your ATS ? I did for quite some time, until I ran into a problem. Many years ago, I noticed that several sites, including Monster, Dice, and LinkedIn were not “obeying” my request for exact phrases in my searches. If I searched for “project manager,” I would get results in which “project” and “manager” were highlighted as keyword hits even though they were mentioned separately and not together as a phrase. She summarily explained to me that Dice doesn’t recognize Microsoft Word’s default quotation mark format (aka “smart quotes”). Turns out that Monster, LinkedIn, and many others don’t recognize “smart quotes” for exact phrase searching either. Well, I didn’t want to build my searches in Dice’s search field because I could not see my entire search string as I was building it. This is an issue with just about any job board resume database, ATS, Internet search engine, and social network – the search fields are all ridiculously short (e.g., LinkedIn’s is 37 characters). After my call with the Dice support rep, I started using Notepad to build and save my searches so I could simply copy and paste them directly into any job board resume database, Internet search engine, social network, and my ATS and they would recognize and obey the quotation marks as a request for an exact phrase. However, it turns out there is a way to force Microsoft Word to not use “smart quotes” and instead use “straight quotes” – which most sites, social networks, databases, and search engines will obey as a request for an exact phrase. First, go to File –> Options. Then go to Proofing and click on AutoCorrect Options. Once in the AutoCorrect options, choose the “AutoFormat As You Type” tab, and then ensure that the “Replace as you type – ‘Straight quotes’ with ‘smart quotes'” is NOT checked/selected. From then on, whenever you type quotation marks, they will be “straight quotes,” which will work for searching for exact phrases on any site or system that allows for exact phrase searching via quotation marks. This also works for MS PowerPoint, for those of you who may copy and paste Boolean search examples from a presentation from time to time. 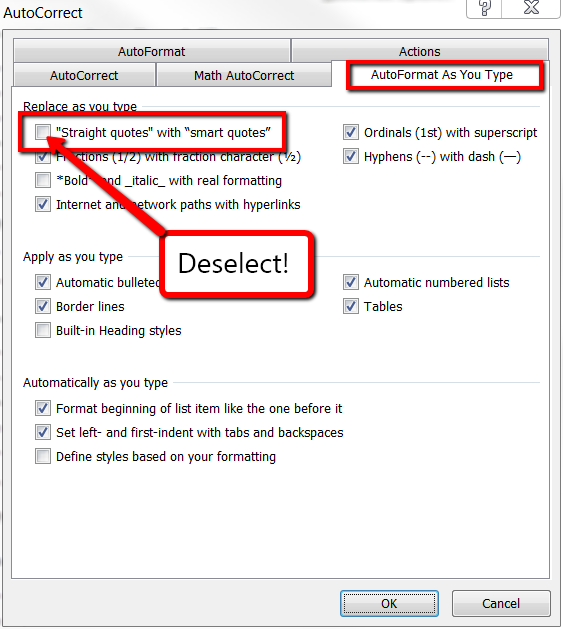 If you happen to have a decent amount of Boolean search strings saved in Word and you didn’t notice the difference between smart quotes and straight quotes, you can use Word’s Find and Replace functionality to quickly convert all smart quotes into straight quotes. Simply invoke Word’s Find and Replace and enter each smart quote in the “Find what” field and a straight quote in the “Replace with” field, and then click “Replace All.” You’ll have to do this with the leading smart quote and the ending smart quote, as they are different. 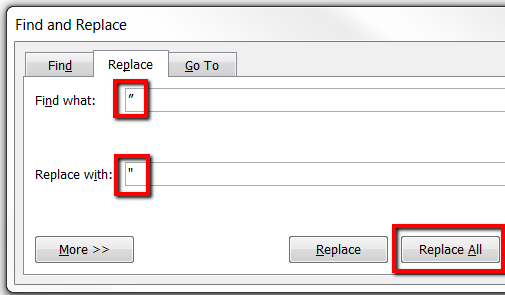 If you don’t want to use Word for building, saving, and copying/pasting Boolean search strings, you can use Notepad. You can also use Excel if you like, as Excel doesn’t use smart quotes. Excel has the added benefit of allowing you to automatically build large Boolean OR statements as well. Another option is Google Docs, which allows for the ability to share and collaborate with a library of Boolean searches online with others. However, by default, Google Docs also uses smart quotes.